Prompt: Today's Write The Book Prompt was inspired by the interview you heard with Doug Wilhelm. The crux of this prompt is find out what you don't know. And the advice is really twofold. First of all, decide if you need to do more research in order to move forward with your writing. What don't you know that a book or a person or the experience of immersing yourself in a situation might teach you? Do that research before continuing with your work. The second part of this advice is to ask yourself relevant questions that aren't being answered in your work, and then free write. These questions may be closer to the heart of your project than simple research. For example, if your main character is an arsonist, you might need to do research on how to set fires. But you'll also need to ask yourself, Why is my character setting these fires? What is motivating him? If you don't already know the answer, then put the question to yourself and spend some time free writing. Interview with Philip Baruth, UVM Professor, author, VPR commentator and award-winning blogger. Write The Book is a radio show for writers and curious readers. 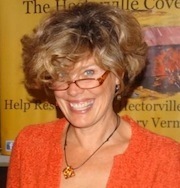 Hosted by Shelagh C. Shapiro, Write The Book airs on WOMM-LP 105.9 FM “The Radiator,” in Burlington, Vermont, every Saturday morning at 9:30 a.m.